This small size high capacity battery is an excellent backup battery for 12V CCTV Surveillance Cameras or many other devices that require 10V to 12V DC power. It has 57Wh (Watt-Hour) capacity, equivalent to 15600mAh if rated as other external batteries on market. For reference, an AA battery has about 2.7Wh capacity. This may help calculating your expected run time. This battery actual output voltage range is between 9V to 12.6V: when the battery is fully charged, its maximum output voltage is 12.6V. The output voltage drops gradually during discharging process, and the cut off voltage is 9V. 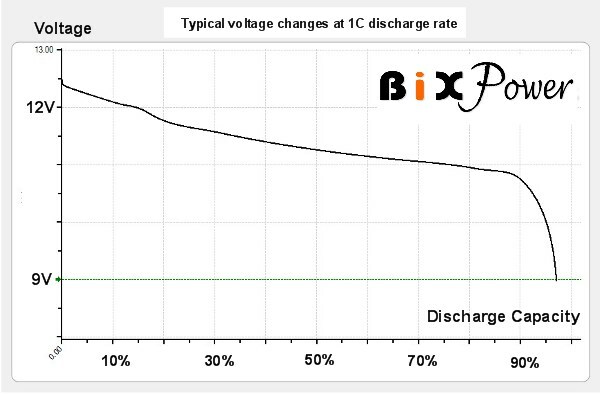 Most of them, the battery output voltage will be around 10.5V ~ 11.5V . Built-in battery gauge which displays power level of the battery pack. Built-in charging control circuits. 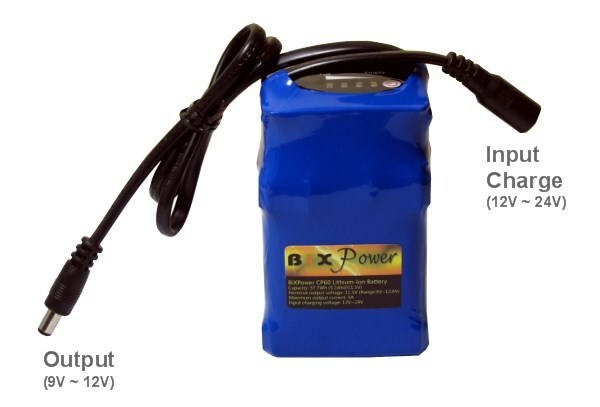 This battery can be safely charged by any 12V to 24V regular power adapter, solar panel or other 12V to 24V DC power source. Size: 4" x 2.2"x 1.6"
The battery output cable and connectors are configured as positive polarity, which meet the needs of most of devices. This battery has built-in controller to control actually charging process. 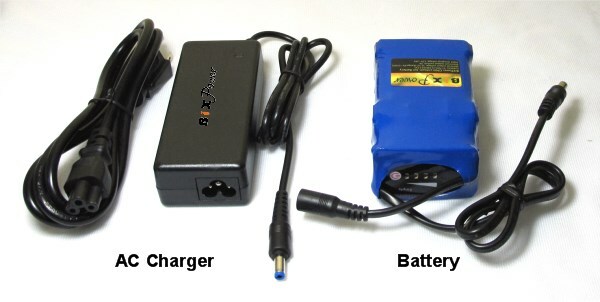 It can accept a regular power adapter with 12V to 24V output voltage as a charger. The charger polarity should be positive. Please monitor the charging process and react to potential problems that may occur. If you cannot monitor the battery charging, please make sure to leave it on isolated fireproof area, away from other flammable materials. Please recharge the battery before it is fully exhausted. It is recommended to charge the battery at least once everything 3 months if the battery is not in use. 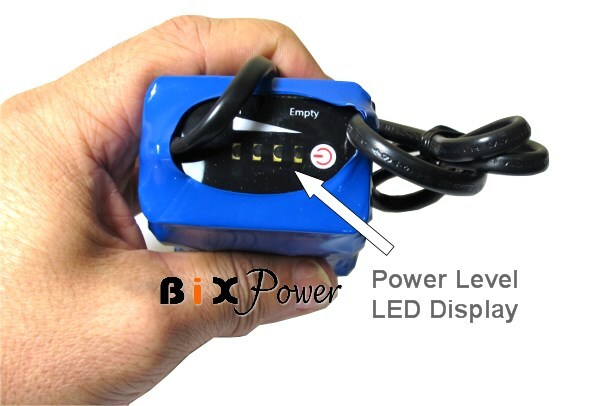 If the connector on battery output cable does not fit your device power input jack, there are many different size optional C series connector tips are available from BiXPower. Those C series optional connector tips can be purchased separately. 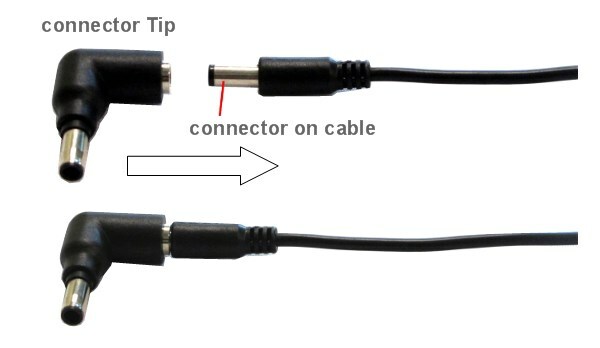 A C series connector tip can plug over the current output connector to form a new size connector.